Those without value-creating human/social capital will be mired in a low/minimum wage environment that will make it difficult to escape debt-serfdom. Let's start with the sobering reality that the Millennial generation faces economic challenges that are unique to this era: sky-high student loan debt, soaring costs for basics such as rent and healthcare, a stagnant neofeudal crony-cartel economy and an intellectually bankrupt status quo in thrall to failed ideologies: Keynesian Cargo Cult central banking, outdated models of capital and labor and an unthinking worship of debt-funded centralization as the "solution" to all social and economic ills. The potential solutions are also unique to this era. Never before has humankind had such a wealth of revolutionary decentralizing technologies: nearly friction-free peer-to-peer networks and commerce, decentralized cryptocurrencies and the expansion of what my friend G.F.B. describes as neo-tribalism: opt-in communities that are not bound to geography or central-state imposed identities. Many smart, well-informed people see massive government stimulus using borrowed money as the "solution" to Millennial impoverishment and under-employment--in other words, more debt-funded centralization. The idea here is that such debt-funded stimulus will employ millions of Millennials to rebuild America's crumbling infrastructure. While we all understand the appeal of this proposal, those proposing it have little experience in actually building or repairing infrastructure. The assumption that such massive public spending will create millions of jobs is never examined closely, nor is the impact of adding trillions of dollars in additional public debt considered. What such schemes boil down to is: Millennials are supposed to borrow trillions from their future earnings and their children's earnings to fund a few years of employment. But what happens after the bridges get repaired and the homeless housing gets built? 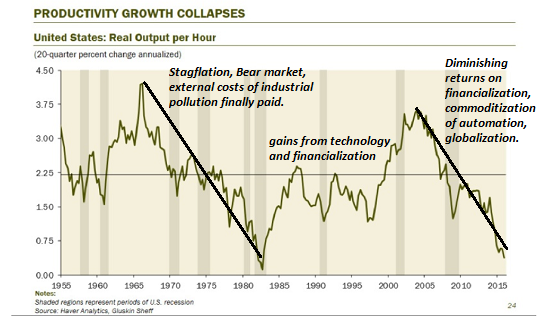 In the conventional fantasy, the economy magically moves into a self-sustaining growth cycle because those construction workers will be buying more coffee at Starbucks, more lunches at Mickey D's, and so on. But the cold reality is: once the money has been spent, those jobs go away.Once the bridge has been repaired with public money, the workers are laid off because there is no private-sector funding for more bridges or homeless housing, etc. Once the construction workers are laid off, sales at coffee shops and fast-food outlets fall back to pre-stimulus levels. The surge in employment fades as soon as the funding dries up. Additionally, there is little productivity gain from the infrastructure spending: the repaired bridge performs the same service as the aging bridge. The problem is this: after the government funding dries up, we still have a corrupt crony-cartel economy based on predatory privilege, parasitic rackets and central-state enforced fraud. In other words, we still have an economy that strangles productivity that could benefit the many in order to further enrich the few. And as Gail Tverberg and Art Berman have explained, we have an economy that is facing lower energy consumption per capita (per person)--even if oil prices remain around $40/barrel. Central state stimulus funded by debt only creates a brief illusion of prosperity; it changes nothing in our broken system. All it does is burden a heavily indebted generation with more debt--a generation that cannot afford to consume more because so much of their income is already devoted to debt service. The other fly in the ointment is this sort of spending doesn't create as many jobs as the uninformed assume. If you stop and look at a bridge being repaired, you'll note the crew is small--in many cases, a half-dozen or less. The same is true of road resurfacing crews and other infrastructure repair work. You'll also notice the crew has skills that take years to acquire: operating a crane, welding, etc. The unskilled are limited to waving the traffic-control flags. The same is true of new construction. If you count the workers erecting large new residential buildings, you'll note a few dozen workers on site--and the buildings are finished in a matter of months. Since on-site construction labor has been more expensive than factory labor for decades, construction fabrication has been pushed to the factory. Beams, walls and other components are assembled at the factory, where wages typically remain between $15 and $20/hour. These components are shipped to the site and assembled by small crews of skilled workers. Much of the expense in construction is now in the financing (private or public, the interest payments and bond sales fees constitute a large percentage of total construction costs), permits/fees and materials. The actual labor component of major construction/repair work is relatively modest. It makes no financial sense to hire people with little experience for high-skill tasks. What makes sense is to increase the hours of the experienced workers the contractor already employs. What is the payoff for a contractor to spend three years training neophytes to become productive? That only makes sense if you can keep the trained worker, and the intermittent nature of construction work means your workforce shrinks when demand falls. The worker you trained goes off to work for somebody else. The beneficiaries of infrastructure stimulus will be workers that already have the requisite skills and experience--Gen X and those Millennials who have completed formal or informal apprenticeships. But even these workers have to look beyond the few years of infrastructure stimulus, and acquire whatever skills the private sector will need. As I explain in my book Get a Job, Build a Real Career and Defy a Bewildering Economy, whatever is abundant has little scarcity value: that includes unskilled labor and credentials such as college degrees. What's scarce are value-creating skillsets, most of which are path-dependent, i.e. they must be accumulated over years of work experience. What creates value? The ability to solve problems and increase productivity. As I explain in the book, the line between labor and capital is becoming blurred.Capital is increasingly intangible: the most productive forms of capital are human, social and intellectual--the knowledge, experience and networks acquired by people. In contrast, the return on money--a traditional form of capital--is near-zero. Owning a credential is not the same as owning skills. If we think of human/social capital as an asset, then we see a new line between labor and capital: labor is low-skilled labor with little scarcity value, and capital is high-skilled human/social capital. Those without value-creating human/social capital will be mired in a low-wage/minimum wage environment that will make it difficult to escape debt-serfdom. To understand why human/social capital is the most important form of capital, we must understand that this capital asset is fundamentally an enterprise. 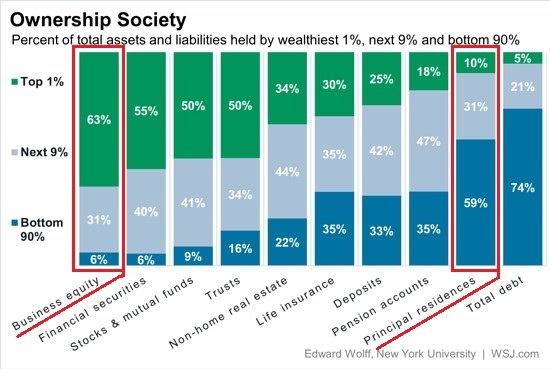 If we look at what wealthy households own, we note they own enterprises. This is not a coincidence, as wealth is generated by value-creating enterprises. If you want to escape Minimum Wage Debt-Serfdom, start by developing skills that create value by solving problems and increasing productivity, which is another way of saying doing more with less. Understand that your human/social capital is fundamentally an enterprise that you own and manage. Taking ownership of your capital and managing that asset as an enterprise is the first step to escaping stagnation. Thank you, Tan J.E. ($50), for your marvelously generous contribution to this site-- I am greatly honored by your support and readership.